Woman to Woman: Resting in Him! Today I read one of my favorite Psalms, Chapter 62. "2 He only is my rock and my salvation; he is my defense; I shall not be greatly moved." It matters not what I face, I know that I have covering in God and in Him alone! If I am being attacked by the enemy, I run to my Salvation and Defense! If I'm sick, I run to my Salvation and Defense! When my heart is overwhelmed, I run to my Salvation and Defense! There is nothing or no one who can cause me to move from His protection...except ME! And I'm not known to be a risk taker. And believe you me, leaving the protection of the One who loves me is taking a risk! God promises us that He'll never leave or forsake us (Hebrews 13:5)! Why, then, would we want to leave His protection? 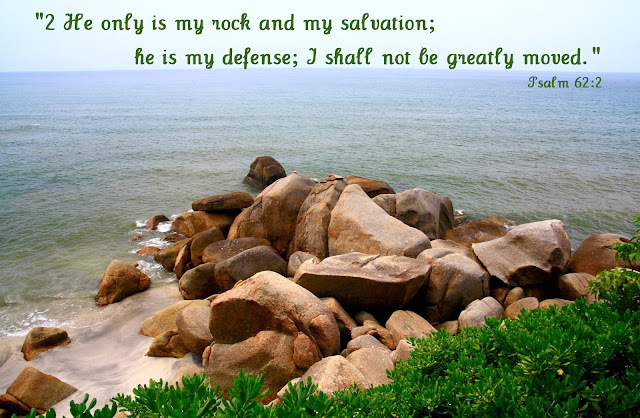 He is my rock, my salvation! He is my defense. That is just one of His many promises and we can stand firm on it and every other promise in the Word of God!